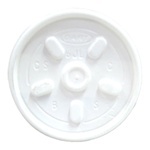 Bulk cup lids for foam and plastic cups are a must-have for restaurants, cafeterias, coffee shops or any food-service establishment providing take-out beverage orders. 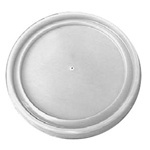 You'll find heavy-duty plastic lids from Restaurant Supply in every size from 6-ounces up to 32-ounces and in wholesale-priced case lots of 500 or 1000 pieces each. The coffee cup lids from Dart Corporation all fit the company’s various sized foam cups, bowls and containers, up to and including 32-oz. 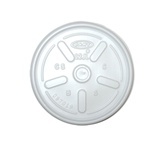 sizes, and Fabri-Kal offers clear, recessed portion and souffle cup lids in quantities of 2500 per case. Three lids cover the company’s entire potion cup lineup. Our disposable cup lids come in all configurations – straw slot lids, no slot lids, vented or non-vented, Lift N Lock, sip-thru and more. Who wants a drink…that could possibly spill all over you? I know I don’t. 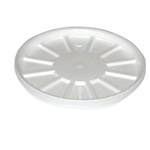 Foam and plastic beverage cup lids are essential for every carry out business at any restaurant or coffee shop. Whether its coffee, soda, tea, or even soup, lids are here to keep liquids in and prevent spillage. Take out the stress of worrying whether or not customers will come back with an attitude because of a spillage accident. You can easily prevent this from happening by offering tight fitting cup lids along with your beverages or soups. We are sure you will find a beverage lid of your liking. At Round Eye Supply, we try to relate to our customers and provide the best prices of high quality restaurant supplies.